AirDroid is an Android-exclusive app that enables you to control your phone or tablet with a computer using wireless networking. AirDroid also allows you to receive and send text messages, reject or make calls, and receive messages or notifications. You can also move your files through your computer. You can Control your phone by using a Web client, so you don’t need to download any additional software. To use this app, just download the desktop computer software from the official website using your Mac or PC and also install the mobile app on your phone. 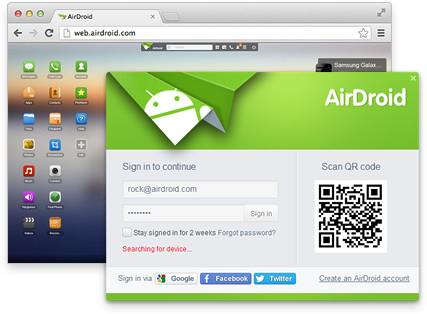 Therefore, AirDroid is a remote access and control app of your smartphone using your laptop or desktop PC computer. 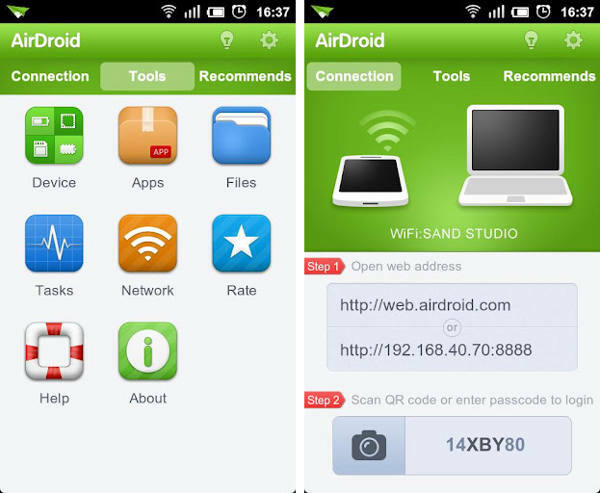 Download AirDroid on your Android phone using the link above, and then open the app. It will ask you to make an account, but it’s not really necessary to make one – You can just click on the ‘Sign in Later’ button found at the bottom of the app. Next, AirDroid will ask for your permission to show notifications in your computer – Click on ‘Enable’ to agree. You will be taken to the system settings to get access to your notifications. Click on AirDroid Notification Mirror service. After the confirmation pop-up appears, click on ‘Ok’. Press the back button on your phone to go back to AirDroid. The application will now show a URL on your phone: https://web.airdroid.com/. Open the URL in your preferred Web browser on the computer. You will encounter a QR code inside the browser window. On AirDroid, click on the QR code image beside the URL. This will open your phone’s camera. Point the camera towards the QR code in your computer’s browser window. The app will vibrate after it is done scanning the code. You will now receive all of the Android notifications in your browser window. To send messages using AirDroid, click on the Messaging icon. You can find this on the AirDroid app in your browser. This will open up a window containing all of your contacts. Click on the contact of your choice, and type away. This process is the same as Skype or any other type of messenger, and it’s easy to use as well. By using AirDroid, you can send messages to your phone contacts without the hassle of a tiny phone screen. You will receive a notification when you get a text message. Click on the notification if you want to view the text. You can also click on the Messages app to look at all of your incoming messages. You can also make calls using AirDroid on your computer, but you can’t share these calls with your computer, since it’s only handy as a phone dialer. To start, click on the phone icon found on the top of the page. It’s located right next to the search bar at the web.airdroid.com URL. Type in the number on the keypad. While typing, a list of your contacts that have the same numbers will appear on the right. You can also click on the contacts that you want to call. Next, click on the Call button. You’re going to have to switch to your Android phone to talk to your contact. Although connecting a Bluetooth receiver to your phone would also work. Unfortunately, you can’t receive calls through your computer, but it’s still possible to reject calls by using a text. If you receive a call from someone, you will get a pop-up on your browser window. Just click on ‘Reject’ to turn down the call, or ‘Reject with Message’ to send an accompanying text message to the caller.